Over twenty years ago, Tsfat was a tiny, quiet haven of fresh air and spiritual growth. It was then that the Reznik family moved from bustling New York City, to a small, arched, stone house within the Artists' Quarter. Between the olive and fig trees, the grapes and the bay leaves growing in their yard, the Rezniks set up an Old World/ New World haven for young men and women traveling to Israel for their year abroad. Be it seminary girls or yeshiva boys, newcomers to observant Judaism or seasoned Balei Teshuva, converts to Judaism or older religious singles--every Jew enthusiastic about his traditional heritage, had a place to stayor eat in the Reznik household. As the years progressed and their family grew, the mitzvah of hachnoses orchim (welcoming guests) spread throughout the beautifully developed town of Tsfat, so that each Jew seeking a place for Shabbes could always findpeace and good Jewish cooking,in the city-wide endeavor to provide for those big-city-folkwho needed to emotionally recharge and physically relax. Following the example of older families who had proceeded them to Tsfat, the Rezniks and their children worked diligently, throughout the city,that guests and hosts be mutually happy to have met and have hadthe opportunity to do a mitvah for each other-- to have Jews connect through the deep power of a Shabbes-table in the Holy City of Tsfat. This enthusiasm spread to throughout the week, as more and more people came up to "experience Tsfat", even if they could not stay for a Shabbes. Seeing that they themselves no longer had enough space to continue hosting in their modest home, the Rezniks recently added on a rustic, villa-style apartment, overlooking the garden courtyard. Up one flight, this rental apartment has a lovely view of Mt. Meron stretching towards Tiveria. 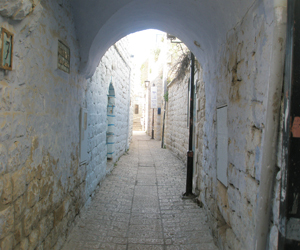 Their street is the road right above the famous"Arizal's mikva", near the Kiryat Breslev neighborhood in the Old City. Stores, shuls, mikvas and L' Mehadrin restaurants are all within a short walking distance. Rentable as one apartment or three individual units, there are three bedrooms with a total capacity of 10-12 beds + extra mattresses, surrounding the practical and attractive central entrance and kitchenette-area. Suitable for entire families, groups of bochrim or groups of young women; a large fridge, large sink and counter, electrickettle, Shabbos hotplate, and table for 6-12, makes the space homey and comfortable. Extra cooking facilities are provided for upon request. There are two bathrooms with showers, with a roofed porch for all seasons, surrounded by the traditional, Eretz Yisroel, olive and pomegranate trees. Another Sukkah porch, connected to the apartment,is available during the summer and for Jewish holidays. Their street, Keren Hayesod, is easily accessible by car, with express buses from Yerushalayim, Bnei Brak and Ashdod stopping at the end of the block. The Reznik Guesthouseis available year-round, weekdays or weekends, with comfortable beds, linen, heating, fans and A/C. Suitable for observant, Jewish clientele. The Reznik family's up-beat, warm, heimishe service is provided in fluent English, Yiddish or Hebrew. Students: 70sh per bed, sheets included. Economy: 60sh Bring Your Own Sheets. Couples: 200sh per small room, sheets/ towels included. During Bein Hazmanim vacations: 250sh per room. Large Family room (fits 6 beds): 350sh, sheets included. During Bein Hazmanim vacations: 450sh. Entire apt: 700sh with sheets, 600sh Bring Your Own Sheets. During Bein Hazmanim vacations: 800sh w/ sheets. Reductions available for reservations of 3 or more nights.